She married (---?---) Dalton. Nancy was born at De Kalb County, Missouri, on 15 March 1847. Nancy died on 27 February 1911 at Maysville, De Kalb County, Missouri, at age 63. Benjamin was born at De Kalb County, Missouri, on 19 September 1848. His body was interred in January 1867 at Maysville, De Kalb County, Missouri, at Redman Cemetery. Benjamin died on 20 January 1867 at age 18. James was born at De Kalb County, Missouri, on 8 November 1850. James died on 6 February 1871 at age 20. His body was interred in February 1871 at Maysville, De Kalb County, Missouri, at Redman Cemetery. 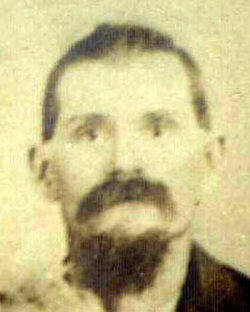 Thomas was born at Hardin County, Kentucky, on 3 January 1853. Thomas died on 3 July 1942 at age 89. Elem was born at Hardin County, Kentucky, on 11 November 1864. Elem died on 18 November 1925 at age 61. William was born at Hardin County, Kentucky, on 5 October 1868. William died on 14 October 1872 at Cass County, Missouri, at age 4. Mary was born at Cass County, Missouri, on 9 March 1870. Mary died on 24 October 1948 at age 78. Martha was born at Cass County, Missouri, on 22 January 1873. Martha died on 16 September 1874 at age 1. America was born at Hardin County, Kentucky, on 9 November 1857. America died on 11 September 1941 at age 83. Sarah was born at Hardin County, Kentucky, on 17 November 1861. Sarah died in 1950. Amy died. Amy was born at Hardin County, Kentucky, on 26 October 1861. H. died. H. was born at Hardin County, Kentucky, on 8 December 1862. Sarah was born at Hardin County, Kentucky, on 4 July 1864. Sarah died on 21 February 1882 at age 17. Lavenia died. Lavenia was born at Hardin County, Kentucky, on 27 July 1866. Rosa died. Rosa was born at Hardin County, Kentucky, on 9 October 1869. M. died. He married Belle Tichenor. M. was born at De Kalb County, Missouri, on 13 February 1872. Bettie died. Bettie was born at Hardin County, Kentucky, on 5 December 1876. Jerome was born at Hardin County, Kentucky, on 13 November 1868. Jerome died on 3 November 1875 at Hardin County, Kentucky, at age 6. His body was interred after 3 November 1875 at Hardin County, Kentucky, at Valley Crreek Baptist Church Cemetery. Virgil was born at Hardin County, Kentucky, on 18 October 1872. He married Clemintina Ash at Hardin County, Kentucky, on 2 January 1898.1 He married Mary A. (Redman) Atherton on 8 April 1931. Virgil died on 26 December 1952 at Hardin County, Kentucky, at age 80.1 His body was interred after 26 December 1952 at Hardin County, Kentucky, at Valley Crreek Baptist Church Cemetery. Clemintina was born at Hardin County, Kentucky, on 13 September 1871. She married Virgil Hewitt Tabb at Hardin County, Kentucky, on 2 January 1898.1 Clemintina died on 5 September 1929 at age 57. Her body was interred after 5 September 1929 at Hardin County, Kentucky, at Valley Crreek Baptist Church Cemetery. Weed was born at Hardin County, Kentucky, on 10 May 1877. He married Martha E. Brown at Hardin County, Kentucky, on 15 April 1906. Weed died on 16 June 1958 at Hardin County, Kentucky, at age 81. His body was interred after 16 June 1958 at Hardin County, Kentucky, at Valley Crreek Baptist Church Cemetery. Martha was born at Hardin County, Kentucky, on 14 March 1884. She married Weed Davenport Tabb at Hardin County, Kentucky, on 15 April 1906. Martha died on 27 August 1958 at Hardin County, Kentucky, at age 74. Her body was interred after 27 August 1958 at Hardin County, Kentucky, at Valley Crreek Baptist Church Cemetery. Granville was born at Hardin County, Kentucky, on 29 November 1904. Granville died on 11 March 1906 at Hardin County, Kentucky, at age 1. His body was interred after 11 March 1906 at Hardin County, Kentucky, at Valley Crreek Baptist Church Cemetery. Woodrow was born at Hardin County, Kentucky, on 3 July 1917. Woodrow died on 11 November 1921 at Hardin County, Kentucky, at age 4. His body was interred after 11 November 1921 at Hardin County, Kentucky, at Valley Crreek Baptist Church Cemetery. Mable was born at Elizabethtown, Hardin County, Kentucky, on 29 July 1898. She married Floyd Turner on 19 November 1923. Mable died on 23 August 1969 at age 71. Elizabeth was born at Kentucky on 1 January 1854. She married James D. Hastings on 24 May 1870. Her body was interred in July 1940 at White Mills, Hardin County, Kentucky, at Union Church Cemetery. Elizabeth died on 19 July 1940 at Hardin County, Kentucky, at age 86. James was born on 16 June 1846. He married Elizabeth V. Tabb on 24 May 1870. His body was interred in October 1917 at White Mills, Hardin County, Kentucky, at Union Church Cemetery. James died on 27 October 1917 at age 71.